Has anyone who makes the decisions looked at the wind forecasts for this weekend? Looks like NOAA is forecasting 5 mph winds for Madison through the weekend. Forecasts for MN are in the 10 mph range. Does smoother ice trump adequate wind for regattas? Just wondering. I realize that the Four Lakes Ice Yacht Club is a major player in our otherwise obscure sport. (Kudos to 4LIYC, I am impressed with your club! You're run better than the IDNIYRA in my experience.) But does that mean that they need to absorb all events in the region? My understanding is that the GWC is a tradition for MN as we have a couple lakes that freeze earlier than most. (As you can guess by now, I'm from (central) Minnesota.) And this being a non-IDNIYRA sanctioned regatta, why the quest for Ideal conditions? Wouldn't it be better for our sport to spread our activities as far and wide as possible? Thanks to those who have actually read through this long post. Yes, I'm disappointed that the GWC went from a two hour drive to a six hour drive for me personally; I would be there if I expected some wind to actually sail (I'm not a racer, yet). The first season I was on the ice, I went to the GWC on Lake Christina. It was near my area and it kind of blew my mind. 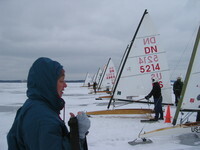 I had no idea of the enthusiasm of iceboating even though I've been a soft water sailor for over thirty years. So, I built a DN. I was looking forward to this regatta all summer particularly for it's "informality" and it's location. I was also looking forward to meeting, speaking with, and learning from others to help grow our sport. Does anybody else see the "big picture"? Maybe I'll see you at the GWC next year. I'm not holding my breath. Perhaps you missed the last paragraph of my last post in regards to Buffalo Lake. If there is no sailable ice, I must have been on a serious hallucinatory trip this past Sunday. I don't recall getting wet at all, and somehow I made it back and forth across the lake where there would be water if it were warmer. I guess I have a lot to learn about this wind blowing things around on frozen lakes thing. What do you call that big white thing attached to the big stick? The guys on Bald Eagle must have been on the same stuff. Don't try to explain to me that Bald Eagle isn't big enough for 80 boats. My comprehension of scale is just fine. With all due respect, I disagree with your assertion that “the iceboating community missed out on an opportunity to help attract new people and grow the sport. What you refuse to recognize is there simply was no “opportunity” in Minnesota. As indicated in my initial response, there was no opportunity because there was no ice in Minnesota. Without ice you cannot hold an event. If you cannot hold an event you cannot claim we missed out on an opportunity to attract new people. And not sailing does nothing to attract new people or grow the sport. There is no event in the iceboating world that has done more to attract new people and grow the sport than the Great Western Challenge. Just look at how much more DN sailing takes place in Minnesota since the GWC was created. The GWC has proven to be a wonderful opportunity for sailors of all abilities to try their hand at DN racing. Every year, year after year, we see new sailors attend the GWC. I sailed my first DN race at the GWC. It was just a scrub race on Friday afternoon. Back then, there were no marks or a starting line. We simply lined up and a guy named “Rats” declared the blue ice fishing house about a mile to windward to be the weather mark. 10 boats sailed one lap. I was last…and hooked. To be sure, it was a difficult decision to move the GWC to Wisconsin. Until this year, it had never been held on ice not located in Minnesota or, as in the case of lacrosse, where you could not at least see Minnesota. To that end, I share your frustration in not being able to sail in Minnesota. We will do everything in our power to return to Minnesota next year. But, we would both be wrong if I agreed with your argument that this was a lost opportunity. The 2014 GWC was a huge success. It will be remembered as an opportunity for sailors from other parts of the country to attend what has become the greatest iceboat event in North America. It was a rare opportunity for new sailors from other regions who otherwise would not make the trip to Minnesota. Personally, I am grateful to all the sailors, new and experienced, who took advantage of the opportunity to sail on Kegonza. There is no better proof of the opportunity the GWC provided than 80 boats parked in front of Springers. With that, I have said my peace. Let’s agree to end this discussion. Let me know when you are near Minnetonka. We can talk over a beer or sharpen your runners. Allow me to respond to your recent blog post. Sometimes it is difficult for a new sailor to realize the effort it takes to host an iceboat event or how hard it is to find a suitable location. As much as we like to hold an event on a certain day or at a certain location there are unfortunately several variables that are outside our control. The lack of safe ice and the abundance of snow are two such variables that quickly come to mind. The historic success of the GWC is due to the fact that it is sailed very early in the season. We can usually find a Minnesota lake that has recently frozen and is snow free. This season, however, we were not so lucky. The early freeze meant that our favorite venues fell victim to the early snow. We would have preferred to sail in Minnesota. For that reason, many sailors spent many hours driving to far away locations to check MN ice. They also called family, friends and even bait shops to get ice reports. They check and checked and rechecked. Despite their best efforts, no regatta quality ice was located. Without any Minnesota ice I suppose one option would be to just cancel the event. Instead, race organizers expanded their search beyond Minnesota. Their logic is simple. Since we all want to sail, let’s see if there is ice somewhere else. That is how we ended up on Lake Kegonza. It was the only sheet of ice (excepting Northern Michigan) that I know of that was sailable last weekend. And, the only reason we knew Kegonza was sailable was because several Madison sailors took vacation days from work last Tuesday and spent the entire day scouting the ice. Three sailors checked the entire lake to ensure it was thick enough and safe enough to sail. We knew that if we moved to Madison some of the MN sailors might not follow us. But, conversely, the move to a more central location brought out sailors who might not have attended had the event been held in MN. Sailors drove from Ohio, Michigan, Rhode Island, Connecticut, New York, Toronto, Ontario, and even as far away as Nova Scotia. We had sailors who flew in from Sweden, Germany and the Netherlands. In the end, over 100 sailors preregistered for the event. We had over 80 sailors on the starting line. From a participation standpoint, I do not think the move hurt us. In fact, from a pure participation standpoint, I would argue that it was one of the best things to happen to the fleet in a long time. 100 sailors preregistered for the event! Saturday night in the hotel I was invited to an impromptu party by the guys from Nova Scotia. It was hard to complain about my drive from MN to Wisconsin to a bunch of guys who had just drove 35(!) hours and some 16 hundred miles. They left last Monday to get there on time! One of the great things about living in America is we can make choices. It is unfortunate that you decided to stay home because the forecast was for light air. But that decision was yours. The 80 sailors that showed up from around the world had a blast. We meet new friends, sailed 8 phenomenal races and learned tons about how to make our boats go faster. We would love to see you on the ice. Feel free to join us whenever and wherever we sail. We truly mean it when we say sailors of all abilities are welcome. However, I do ask that before you criticize us for not holding the GWC in MN you first understand why the event was moved. There simply was no boatable ice in Minnesota. And, please, feel free to scout any of the lakes up in your neck of the woods. If you have ice we would love to hear about it. The point of my post was not "why was it moved?" The point was that the iceboating community missed out on an opportunity to help attract new people and grow the sport as it did me the first year I checked out the GWC. I was only mildly curious about iceboating until an event that was reasonably close allowed me to experience what it was all about. That's why I thought the GWC is a good event to help spread the word to the western fringe of our sport. It is not an IDNIYRA points event, so those who focus on earning the points aren't out anything if conditions aren't ideal. If the extra few miles from Nova Scotia to Minnesota prohibits them from showing up, they are not losing out any standings. I would guess they would have been there anyway. It is America. We all have the choice to continue in our small exclusive clubs and do our own thing. There is also the choice of allowing others in that have new ideas and are willing to put in the effort that it takes to provide for more iceboating opportunities. Twenty years ago, I started playing disc golf. There weren't many disc golf courses around, often we would play by hitting objects in the park or down the street. There were a few clubs around. I joined one. We worked with parks departments, ran tournaments and leagues to raise funds to pay for the baskets, and then dug the holes for them ourselves. I served for a couple years as the president of the Minnesota Frisbee Association, the longest running flying disc club in the nation, I've published newsletters, I've run events, I realize what is involved. I would bet that many of you reading this are aware of disc golf today. It is America. We all can choose to do whatever we like. It is beautiful. Best wishes to 4LIYC and all sailors in the Regional. I'm sure it will run smoothly, it's nice to have a "warm-up" before the sanctioned event. P.S. Lake report. I was out on Buffalo Lake, MN last Sunday. Great wind, patches of clear ice are getting larger, half inch of crust/snow on the rest (shallow crust with snow under). I only have plate runners anyway. I'm guessing the warm trend will smooth out the rest of the snow. As soon as we get another breeze, I'll be back. I am the DN Western Region Vice Commodore. I was not the person who chose the site of the Challenge, but I have been scouting ice for 4 weeks now to help the organizers select the best ice in Minnesota for that event. I agree with the decision to move to Madison Wi as we did not have regatta quality ice in Minnesota. I have personally scouted Buffalo Lake 3 times this season. The latest was 5 days prior to the Challenge. The 50% stiff snow drifts covering the lake was deemed not suitable. Since it is only 30 minutes away from my home and has hosted a number of Challenges in the past I was hopeful! In fact I sailed my very first time in a DN at a Challenge weekend 10 years ago and got hooked. I did not scout Buffalo this week as I knew it would be much the same. I live on Minnetonka and my bay and Buffalo have been identical for weeks. I tried very hard to locate this weekends Regional Regatta in Minnesota. I have had Pepin, Green Lake and Christina all scouted early this week and again found Kegonsa to be the best ice in the region to host this regatta. I will again by Selecting a site for the 2015 Western Region Regatta scheduled for Jan 3-4, 2015. I am hopeful to find the best ice in the Region in Minnesota. Help me find this ice. FYI, Bald Eagle does not have a large enough area to race DN's on a 1.5 mile course. I hope you are enjoying your DN and look forward to meeting you. After this weekend, a number of local lakes including Minnetonka may be suitable. Watch this site for scrub racing opportunities.